Pope Francis explained that walking towards holiness means proceeding towards that grace, that encounter with Jesus Christ. It’s like walking towards the light: many times we don’t see the road that well because the light dazzles us. "But we are not mistaken, noted the Pope, “because we see the light and we know the way". When you walk with the light behind you, you can see the road well, but in reality there is shadow, not light, in front of you. Warning that there are many things that enslave us, the Pope told Christians that they need “to be free and to feel free” in order to walk towards holiness. It is for this reason, he said, that Peter urges us not to conform “to the desires of our former ignorance.” Paul also says in his First Letter to the Romans: "Do not conform," which means don’t get involved in worldly patterns of behaviour. 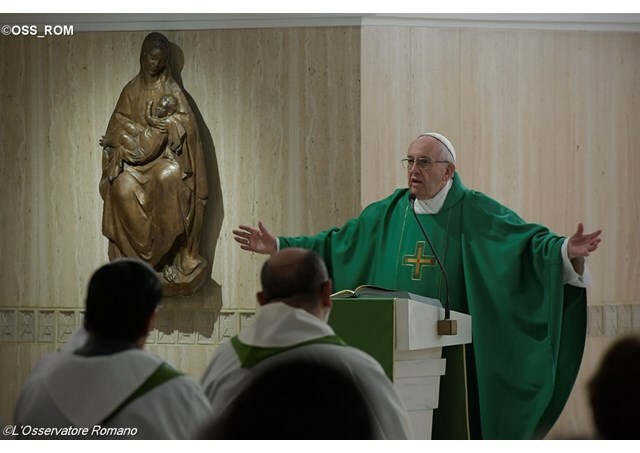 The Pope reminded his listeners that the Lord calls us to holiness every day. And there are two parameters, he added, to know if we are on our way to holiness: first of all, if we look towards the light of the Lord in the hope of finding it and, then if when the trials come, we look ahead and do not lose our freedom by taking refuge in worldly patterns of behaviour, which "promise you everything and give you nothing". "You will be holy because I am holy": this is the Lord's commandment.